Even though many people who study Spanish might not know, there is more than one version of Spanish spoken in Spain. There is a variety of languages and dialects to be encountered when traveling from north to south and from west to east that are influenced by the various cultures and languages of invaders during the country’s history. Castilian, or Spanish, which is taught in Spanish schools is the official language in Spain. 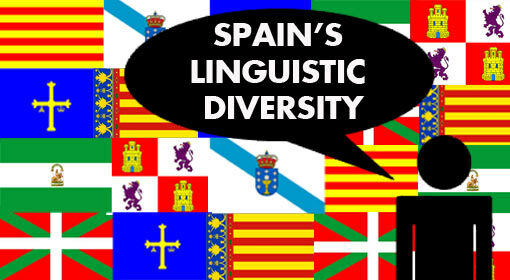 It’s the mother tongue in almost all communities in Spain. However, six of the seventeen communities also have, alongside Castilian, another official language. This bilingualism is commonplace in Spain. According to a survey taken in 2005, Castilian is the mother tongue of 89% of the Spanish population, the Catalan language of 9%, the Galician language of 5%, and the Basque language of 1% (some declared two mother tongues). Except Basque, all of these languages belong to the family of romantic languages. The origin of the Basque language is more or less unknown. Most popular theory says that it stems from the Caucasian languages which are spoken in the region between Russia and Turkey. This could be explained by the presence of people from this region in 1200 BC on the Iberian Peninsula. However, the expanse of the language was reduced by Latin and Castilian such that today it is only spoken in the Basque country in the northernmost parts of Spain. The Galician language of the northwest of the peninsula is strongly influenced by Portuguese and, typical of a romantic language, results from the evolution of the Vulgar Latin. The language sank into oblivion at one point but then experienced a revival during the 14th century when great poets came up writing in Galician. The Catalan language at on Spain’s eastern coast, including the regions of Barcelona and Valencia, evolved directly from Latin. Catalan literature saw great success during the Middle Ages but was almost abandoned from the 14th until the 18th century when the use of the language was limited to administrative documents. Today, with almost eight million speakers, the language is more important than ever. Next to the different languages, there also exists a variety of dialects in Castilian which are however mutually intelligible. The two main families of dialects are those of the north and the south with its border running laterally at the latitude of Madrid. The dialects of the north are not as strong but more diverse than their southern counterparts. The southern dialects, on the other hand, tend to be characteristically strong and swallow, for example, the endings of words or even consonants in the middle of the word. In all parts of the country are Spanish schools which offer courses in Castilian Spanish. All the guest families and hosts for students subscribed to these courses speak Castilian too. However, if you want to do a Spanish immersion program by being entirely surrounded by the most “pure” Spanish, the region Castilla y Leon is highly recommendable. The city of Salamanca, for example, is a popular destination for many students from Brazil, who are keen on learning the original Spanish rather than going the easy way to neighboring Spanish speaking countries: Argentina, Bolivia or Colombia. The languages and dialects in Spain form a colorful mix and make studying Spanish in Spain all the more interesting and diversified! Posted November 29, 2012 by AmeriSpan Staff & filed under AmeriSpan Blogs, Study Abroad Tips, Travel News & Info. Why travel abroad as a student? 1) Anyone who wants to do an internship or a semester abroad can seek support from the Erasmus community. You can get financial support but also discounts. For example, with the Erasmus boarding pass you can fly at very cheap rates. Furthermore, you can request information and assistance in finding accommodation. 2) Also if planning trips on your own the student status offers huge advantages. With the student ID you get discounts in many restaurants, shops, museums, tourist attractions and hostels. In some countries public museums are even free for students or young people up to a certain age, meanwhile the normal prices remain in the stratosphere. Many tour operators grant students up to a 25% discount. 3) As a student you have the time and freedom to travel longer and farther. Once you are in working life you might not get as many days off as you have at your disposal during your studies. 4) It is much easier at this age to meet new people. Many students travel during their studies and often alone because they have very specific ideas and different career goals. There are several tour operators and language schools which market to this particular crowd and through which you can easily meet like-minded people. 5) There are many cards that are temporarily valid and provide you with rebates while traveling. The International Student Identity Card, for example, offers discounts at bars and restaurants as well as hostels and other accommodations. 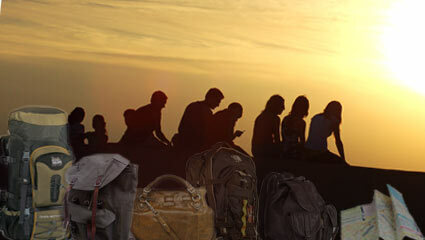 It also offers access to various student travel agencies in more than 90 countries. There is also an international 24-hour helpline for members. Another card is the Euro26 pass with discounts for cinemas, theaters, concerts, museums, festivals, trains, books and much more. Furthermore, with the International Youth Hostel Federation card, which is cheaper for students and young people, you can find accommodation in 80 countries at very affordable prices. 6) Even just obtaining you passport is cheaper. Up to the age of 24 years the passport costs almost only half the price allowing travel outside of the EU. It should therefore be bought at an early age. Posted November 6, 2012 by AmeriSpan Staff & filed under Study Abroad Tips. For those who want to learn Spanish in Mexico and at the same time do sports and relax, Playa del Carmen is the ideal place to go. With its beautiful beaches and nature, this holiday destination is ideal for all who are looking to enjoy a healthy bit of relaxing during a Spanish course or a holiday abroad. But, the region offers even more; Playa del Carmen is one of those ideal scuba diving destinations. With diverse coral reefs and scuba starting points, the coast at Playa del Carmen is suitable for all levels of experience, from beginner to professional. The turquoise waters of the coast here are warm all the year long, offering a very clear view of the underwater habitat. The reefs are so close to the coast that there is no need to first embark on a lengthy boat journey to find diving spots. And even in the winter, the arrival of the bull shark to the coast affords the visitor that incredible experience of swimming amongst sharks… striking distance! Furthermore, unique to Mexico are those cenotes: naturally formed sinkholes where you can find a bizarre flora and fauna completely unknown to the rest of the world. For example, the Mexican Blind Brotula is a truly fascinating species of fish. Diving in these caves is a very special experience which, of course, attracts divers from all over the world. Some of the most popular cenotes are Dos Ojos, Chak Mool, Tajmahal, Gran Cenote and Calavera. Another very popular sport is kite surfing. Hereby, the surfer is dragged by a kite whilst stunting and jumping on and over the waves. The professionals can fly up to 10 meters high in this manner! Kite surfing is a sport which has experienced a great surge in recent years. At Playa del Carmen the winds so lend themselves to the practice of the sport, that the city was chosen for some events during the world championship of kite surf. So if you want to make the most of your vacations, why not chose a Spanish immersion program in combination with a scuba diving or kite surfing course and thus take advantage of all the things Mexico can offer to its international visitors? Learn Spanish and diving at the same time or take a Spanish course in the morning and get rid of all your excess energy in the afternoon kite surfing, and then relax afterwards with some friends at the beach! All of this and much more is made possible with one of our intensive Spanish courses in Mexico! Posted October 16, 2012 by AmeriSpan Staff & filed under AmeriSpan Blogs, Study Abroad Tips. 1 ) Before you travel on your own in another country, it is always advisable to visit the website of the Foreign Office. They know the specifics of each country and can tell you what to look out for. 2 ) If a visa is required, it must also be necessary to apply up to three months in advance. Vaccinations are also sometimes necessary. Are passport and other documents valid until the end of your stay? 3 ) You should also think about a health insurance because the treatment and medication fees abroad can sometimes be very high. 4 ) Furthermore, you should find out about the exchange rate and save important phone numbers and addresses, for example the one of the hotel and your embassy. 5 ) Make copies of your ID, health insurance and vaccination cards. 6 ) Sometimes it is advisable to change money in advance, especially if you travel to countries where your card cannot be used everywhere. 7 ) Check the weather forecast for your holiday period. 8 ) Check the maximum dimensions and weight for checked and carry-on luggage. 9 ) Find out about the available means of transport in your city of destination. 10 ) Check what kind of adapters you need for a travel destination and check the voltage levels in your country of destination. 11 ) Make a list of things you want to carry in your suitcase and hand luggage. 12 ) Account for the possibility of lost luggage by packing in your hand luggage the following: documents, airline tickets, glasses, medicine, cosmetics (in a sealable bag), valuable items such as video cameras, jewelry and money, as well as phone number and address of the hotel, and fresh linen such that you have something to change into. 13 ) When you are preparing the luggage you should remove all signs of previous trips and attach a label with your name and the address of your hotel. Posted October 2, 2012 by AmeriSpan Staff & filed under Study Abroad Tips, Travel News & Info. If you are learning Spanish and want to know more about the history of Spain, you should definitely dive into the world of Spanish cinema. Spanish cinema is not only a mass entertainment medium, but also a first-class historical and artistic form of documentation. Even though it is only of secondary importance compared to English-speaking cinema, it had great influence in Europe (before France) and Latin America (before Mexico). Some of the best known directors are: Florián Rey, Luis García Berlanga, and Antonio Isasi-Isasmendi. There exists a variety of festivals dedicated to the Spanish cinema. Examples are the International Film Festival of San Sebastián, the Seminci (International Film Week of Valladolid) and the Film Festival of Gijón. There are also some more specialized festivals like Animadrid, Festival Punto de Vista and Docúpolis (Comedy Film Festival of Peñíscola). Spanish cinema can be classified into 13 different genres: Historical cinema, films about the bullfight, religious and classical films, musical cinema, Spaghetti Western, Landismo, touristic cinema, striptease, deracinated cinema, military films and films about sports. Typical for Spain are of course the films about the bullfight as well as the Landismo. Films about the bullfight tend to treat the topical issues regarding the life of the bull and the bullfighter. They show aspects of the national festivities, criticism about the bullfight, and the enthusiastic fans of the “Matadors”. The Landismo is a sub-genre named after the actor Alfredo Landa. These films are generally low budget showing the Spanish prototype of that period: short, dark-skinned and obsessed with women. Popular Spanish films are: The Others, the Orphanage, Pan’s Labyrinth, the Sea Inside, Bad Education and Talk to Her. A recent blockbuster is the film Tengo ganas de ti which is already boasting sale figures of more than €3 million. Watching Spanish films does not only help to improve, refresh or learn Spanish, but also to experience the Spanish culture and to get to know more colloquial language, which is often what distinguishes the fine difference between a Spanish and a foreigner speaking Spanish. Whilst watching films is a very convenient way of learning Spanish in the sense of improving your listening comprehension and learning new vocabulary, a Spanish immersion program in Spain is much more effective if you want to talk, learn the grammar and experience the Spanish culture first hand. Furthermore, due to the low prices, you can enjoy Spanish cinema after a day of your Spanish course on the big screen in Spain! Also in our language schools in Spain we regularly offer film nights in which we watch and discuss Spanish films and talk about the history of Spanish cinema. Posted September 19, 2012 by AmeriSpan Staff & filed under Music/Books/Movies. The LTM Star Awards are an elegant awards ceremony for educational institutions offering students the opportunity to work or study overseas. Companies worldwide nominate one North American organization who represents all that is positive about study abroad schemes. Amerispan Study Abroad has been voted Star Agency in North America four years consecutively. Amerispan – “the bridge between cultures” was first established in 1993 by two friends who wanted to spread the word about affordable language institutes in Latin America. Amerispan began as a business plan dreamt up on a beach in a small town North of Rio and is now a successful business that offers courses in over 15 different languages in more than 45 countries! This recognition pushes Amerispan towards our goal of bringing intercultural experiences to everyone. We want to thank all of those that support everyday Amerispan as well as those who have helped to make our dreams a reality: bringing cultures closer. Also, we must mention all the partners and schools involved in our project. Thank you very much. Posted September 11, 2012 by AmeriSpan Staff & filed under AmeriSpan Announcements. Study Spanish in Mexico Lindo!!! Language stays abroad are career booster and adventure at the same time. But the most important factor is that experiences of this kind contribute to your personal development. Do you dream of participating in a Spanish course and escaping from the typical autumn weather? 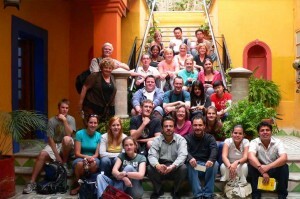 Take now the opportunity and to find more details about Spanish language classes in Mexico. Mexico is no doubt one of the greatest destinations for language students not only from a cultural, but also from a climatic perspective, with moderate temperatures throughout the year. Thanks to its biosphere reserves and protected national parks, Mexico disposes of a variety of regional fauna and flora, which is just waiting to be discovered. In countless Mexican cities you are still able to feel the mystical history and to follow the traces of ancient Maya and Aztec cultures. Mexico is where past meets present… dip into its cultural diversity and increase your linguistic knowledge during a language stay in the Mexican city of your choice. Summer’s almost gone and you are still looking for a Spanish course for autumn 2012? Look for detailed information concerning destinations in Mexico like Cuernavaca, Mexico City, Guanajuato, Playa del Carmen, Oaxaca, San Miguel or Puerto Vallarta…just to mention a few. City flair or relaxing lifestyle on Mexican beaches…the choice is yours! Amerispan guarantees high quality Spanish classes in all partner schools all over Latin America and Spain, with teaching methods that enable you to amplify rapidly your language skills and to experience the regional variety of Mexico. By focusing not only on grammatical matters, but also on vocabulary of “real life situations” you will have the possibility to get to know very closely Mexican traditions, habits and most of all its open-hearted people. My experience tells me that Spanish courses abroad are absolutely necessary for everyone, who wants to learn pure and authentic Spanish, by speaking to natives and getting to know better the foreign culture. Now it’s up to you to choose the Spanish course that best fits you. Amerispan’s schools in Mexico dispose of a great offer of language classes like short and long-term Immersion Spanish courses as well as classes for Business language and Culture. If you prefer to gain academic credits, you can also take part in Semester Programs, enjoying a longer stay in Mexico. To enable you a pleasant stay in Mexico, Amerispan offers great accommodations with host families, which will also foster your oral language skills during the free time. In my opinion this is a unique possibility to study Spanish without much effort. Are you curious? Don’t hesitate to find out more about your Spanish course in Mexico this autumn! Posted August 29, 2012 by AmeriSpan Staff & filed under Uncategorized. Yesterday I went to a concert of the “Original Flamenco Festival 2012″ which is taking place from August 6 until September 2 at the Compac Theatre in the Gran Vía of Madrid which also happens to be celebrating its 70th anniversary. More than 50 artists are participating in the festival which is not only offering concerts but also courses, exhibitions and wine tasting sessions. I was quite impressed by the passion and grace of the dancers, the so-called “bailaoras” and “bailaores”, as well as the emotion and talent with which the vocalist chanted the songs. Flamenco is a typical Spanish music and dance style which originally comes from 18th century Andalucía. The singing, dancing and the guitar constitute the main elements of Flamenco. There are four main styles of Flamenco: Fandango, Soleá, Seguiriya and Tango. The Fandango is a dance in pairs often with castanets and lively, passionate movements. The Soleá is danced by a single female dancer with great expression. She dances slow and difficult movements with her arms and body all accompanied by tap dancing. The Seguiriya is a solemn and melancholic style which is also demonstrated in the dance. The movements are similar to the ones of the Soleá but are generally even heavier. Lastly, the Tango, which should not be confused with the Tango Argentino, is danced in couples and is characterized by many hip rolls, flowing arms and hand gestures. Madrid is the ideal place to learn Flamenco. The city is a stronghold of this passionate and romantic dance and offers many opportunities to perform, listen, or watch Flamenco. Why not combine an intensive Spanish course with Flamenco classes at one of our language schools in Madrid? This is the best way to dive into the Spanish culture and to experience what it is all about to live and study in Spain. The dance is not only a good medium to get to know the culture as well as equal-minded people, but also a very good form of exercise and fantastic way to have fun at the same time. The flamenco course is adapted to your Spanish course schedule and consists of several hours a week in order to teach you this fantastic dance during your time on the Spanish immersion program. Grab your dancing shoes! Madrid is waiting for you! Posted August 14, 2012 by AmeriSpan Staff & filed under Music/Books/Movies. 1) The greatest advantage of a longer stay abroad is probably the acquisition of a new language. It’s a lot easier to learn a language abroad because it has to be used all the time; much more than in class or at home. Furthermore, you also learn colloquial phrases, which is more important in everyday life than you might think. 2) To travel abroad brings you forward not only personally but also intellectually. It opens up new perspectives and ideas and you will be more independent and responsible towards other cultures. You learn a lot by talking with other people from different countries with different attitudes and different mentalities. You practice how to talk to people and get to know more about their way of thinking. 3) To study abroad is an strong attribute on your resume. It also offers advantages in the workplace because these experiences make you stand out from other applicants. The administrators of graduate programs prefer people who have studied abroad. The experience abroad thus increases your job opportunities and your financial gaining potential. Many companies seek bilingual executives and this trait will increase your future bargaining power. 4) It is very likely that you will form some of the deepest friendships during your stay abroad. You have the opportunity to get to know people of different ethnic and cultural profiles. Other travelers abroad are just as far away from home as your and know how you feel and can therefore help you to get over that initial foreigness. Although you are so different, you will quickly discover many similarities. 5) You get to know your own country much better whilst abroad. Most of what others know about you comes from the media, such as music, films and television programs. This is your chance to prove that these stereotypes do not always apply. You are the ambassadors of your country, your culture, and thus you can contribute to the cultural melting pot! At the same time you can dispel any erroneous stereotypes about others by getting to know the other culture first-hand. Excursions to cultural sites and museums will also help you to get to know the culture of the host country. There are differences in each country’s landscapes, climates and historical places, things that contribute to the world history. 6) A stay abroad can change your entire life. Perhaps you will notice that you like a completely different field of studies and you change your study plan, or you realize that you like this new country much better and you decide to move there later on. Or if you are in your Bachelor you can decide studying your Master abroad, which means for a big advantage for your CV. Posted August 1, 2012 by AmeriSpan Staff & filed under Study Abroad Tips. I teach Spanish as a foreign language. I’ve worked with don Quijote for a long time now, but I still don’t like doing it. Do you travel abroad often? I travel abroad as often as I can. I’m very interested in cultures that are different than mine, and clearly the best way to get to know them is by traveling. I’ve thought about it, but I’ve never had the chance to, although I know from my experience working with students from all over the world that it’s an important life-experience for anyone. Which languages do you speak or have studied? I speak French and English. I studied French in high school and I learned French along the way. I’ve taken courses in German; I can understand some but I can’t speak it. I also understand Italian and Portuguese. How and why did you get into the Study Abroad market? Because I think it’s a fascinating field. I think that having the chance to act as a communication bridge between different people from all parts of the world is incredible. What is your job or function at the organization? I’m a teacher and right now I’m also responsible for the online lesson content for don Quijote and their group. The absence of routine, having to look for solutions and constantly improvising so that everyone that wants to learn Spanish can learn it. I also like the chance to learn a lot of things about a lot of different areas that in other circumstances I wouldn’t get. Was a person, group of people or organization instrumental in your success? I think the word success here may be going too far. Clearly, to explain my career with don Quijote, I have to mention Caridad Santana, who always had so much confidence in my potential and I don’t want to let her down. And of course, firstly the group of teachers in Granada, and then in Tenerife, who’ve always been, and are available to collaborate, lend a hand and not let me rest on my laurels. Tell us one of your biggest challenges in starting your organization. My permanent goal is to make my explanations clear and simple and to be able to make the student feel like learning is easier than he or she expected. Can you tell us about your school’s philosophy, specialty and/or why you think it is special? Another reason: Getting to know people from all over the world. When someone –that doesn’t work at don Quijote –wants to meet people, they have to move around, travel… I, we, are lucky in that the world comes to us, we just have to have a receptive attitude and we get to enjoy the world in our own house, to put it a certain way. Posted July 27, 2012 by AmeriSpan Staff & filed under Meet the School.